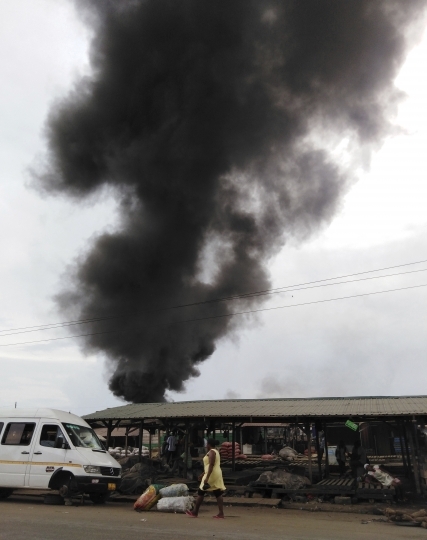 ACCRA, Ghana — On any given day, plumes of noxious smoke rise above the Agbogbloshie dump site in Ghana's capital, Accra. It's a dangerous way to make a living, but an easily available one for the many unskilled workers arriving in search of money to get by. Ghana imports about 150,000 tons of secondhand electronics a year, according to a 2011 study coordinated under the Basel Convention, a global treaty on hazardous waste. 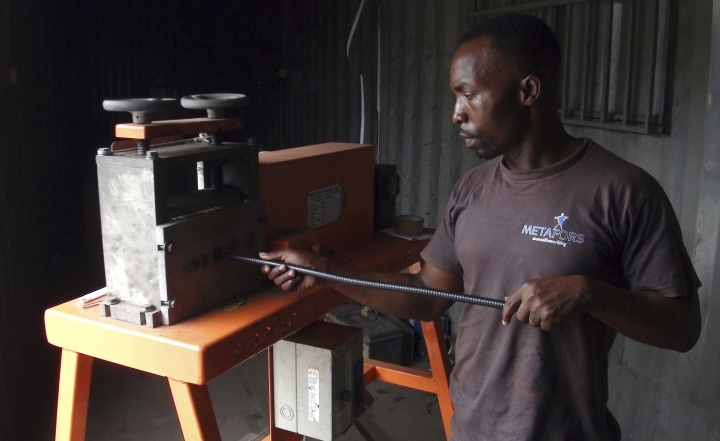 Like many of the informal e-waste recyclers picking through the trash that comes largely from Europe and North America, Amin Idris comes from northern Ghana. After too many lungfuls of the acrid air, he decided to change his approach. "When I used to burn these cables, I felt ill," he said. "That's why I stopped burning and started bringing cables in here." He stood at a wire-stripping machine at Green Advocacy Ghana, a non-governmental organization that operates inside the Agbogbloshie dump. For a fee ranging from 2 to 10 U.S. cents per pound of metal, electrical cables are fed through blades that slit open the plastic, making it easy to reach the copper or other metal wires inside. 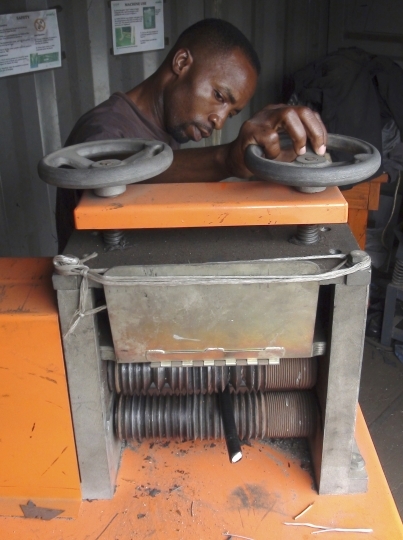 "When I strip cables here, it looks much better than burnt copper, and we'll get higher prices for this stripped copper" Idris said. Bennett Nana Akuffo has run Green Advocacy Ghana for more than three years. "Every month, every year, we keep on getting more and more people. It's a slow process and the people we are dealing with, for want of a better word, they are sometimes difficult to accept change," Nana Akuffo said. "So it's been a slow and gradual process." The Environmental Protection Agency is Ghana's main environmental regulator. "The law prohibits open burning of waste, in any form or shape. This includes electronic waste," Principal Program Officer Larry Kotoe said. "Having said that, we are not saying the e-waste recyclers shouldn't burn but rather that this predominantly informal sector should be transformed. The law is seeking to rebuild their capacity, retool them, so that they can safely dismantle e-waste." While only Green Advocacy Ghana is currently active on the ground in the Agbogbloshie dump, the German government in partnership with Ghana's government is building a health clinic and e-waste recycling training center due to open there in early 2019. For professor Julius Fobil with the University of Ghana, more community participation from the start would make a project like Green Advocacy Ghana more effective. Environmental literacy among the informal workers "is currently very low," he said. Fobil is concluding a long-term study of the health effects on e-waste recyclers at Agbogbloshie. He carried out blood and urine tests on a group of e-waste workers between 2016 and 2018. They "tend to have difficulties breathing," he said. "Ailments range from minor coughs to complicated health problems like COPD. That's chronic obstructive pulmonary diseases. We are also seeing that some of them are susceptible to long-term exposure like the increase of cancers — cancer due to exposure to some of these complex chemicals." That's a cost the dump's informal recyclers, who make up to an estimated $285 a month, cannot afford to pay.